HALIFAX -- A massive container ship that has been burning in international waters off Canada's east coast since Jan. 3 now appears headed for the Bahamas instead of Halifax, its original destination. Satellite tracking shows the smouldering, 320-metre ship is being slowly towed to the southwest, travelling about 130 kilometres per day. No one was hurt after the fire broke out as the ship sailed about 1,900 kilometres southeast of Halifax, but the vessel's 22 crew members were evacuated from the ship as the fire grew and the weather turned ugly. Peter Ziobrowski, the blogger behind the Halifax Shipping News, says satellite data indicate the two tugs pulling the stricken ship have plotted a course to Freeport on Grand Bahama Island, which has a substantial container terminal. Ziobrowski says photos of the ship and information provided by its owner, Hapag Lloyd of Germany, suggest the fire has destroyed many containers on the ship's forward deck. "It looks like the centre of those front four stacks have collapsed," Ziobrowski said in an interview. "What you have there is a pile of smouldering cargo and containers ... And the hold below is going to be heat damaged and probably filled with water." The company has confirmed all cargo in the ship's first 12 bays, and some of the cargo in the two holds beneath those bays, have been affected by the fire. "Damage caused by smoke, heat and ... water in adjacent areas is possible," the company said in a statement on its website, adding that many other containers with refrigeration units have been switched off. A spokesman for the Hamburg-based company issued a brief statement Tuesday, saying the fire is under control and salvage operations are underway. However, Tim Seifert says there's no estimated time of arrival in Halifax or any other port, though he confirmed the ship was headed southwest "towards more favourable weather conditions." "At this time, it is not yet possible to make a precise estimate of any damage to Yantian Express or its cargo," the company said. "This can only be more clearly assessed once the vessel reaches a port." Five of the ship's 22 crew members, including the captain, have returned to the ship with some salvage experts, Seifert said. The other crew members were recently picked up by another vessel, and they have since been flown to their home ports. 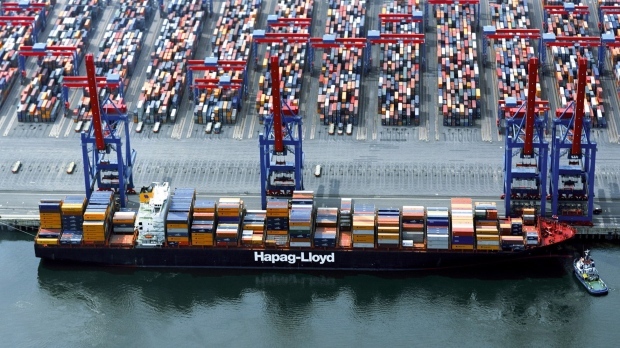 Ziobrowski, who has been producing the Halifax Shipping News for 10 years, says it appear Hapag Lloyd has dispatched the Shanghai Trader, another container ship, to pick up the cargo that can be salvaged. The Yantian Express was travelling to Halifax from Colombo, Sri Lanka, via the Suez Canal, when the fire started. The blaze was brought under control by ocean-going tugs equipped with high-powered water cannons.